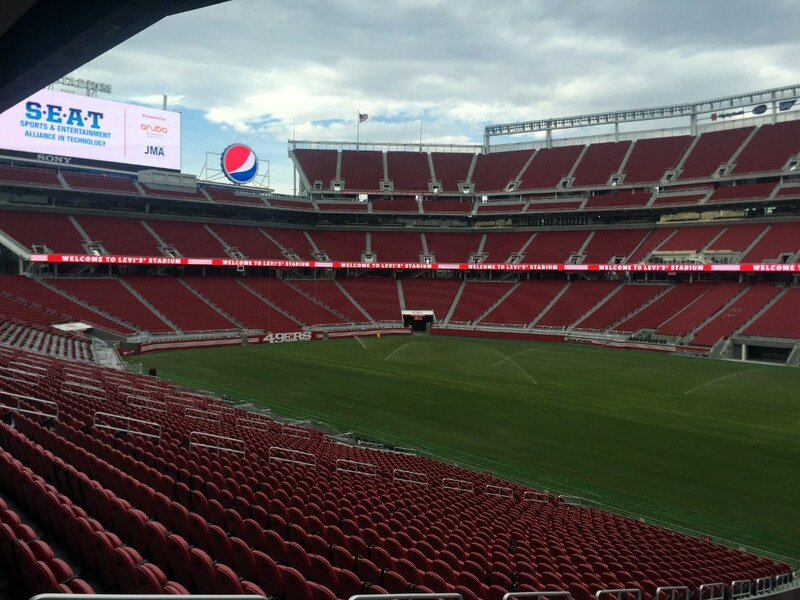 Levi’s Stadium was built to become the new home of the San Francisco 49ers (NFL). The 49ers had been looking to built a new stadium since 1997 when plans were presented to replace Candlestick Park, which was showing its age, with a new stadium. However, various plans failed to progress, among others due to transport complications to the site in the south-east of San Francisco, and in 2006 the 49ers decided to focus on building a new stadium in the city of Santa Clara, 40 miles south of San Francisco, instead. The stadium proposal received final approval in 2012 when the final piece of funding was agreed, and construction started soon after in April 2012. Construction of the stadium took a little over 2 years, and Levi’s Stadium officially opened on 17 July 2014 with a ribbon-cutting ceremony. The stadium came at a cost of $1.2 billion. The first match at the stadium was an MLS league match between the San Jose Earthquakes and Seattle Sounders (1-0) on 2 August 2014. 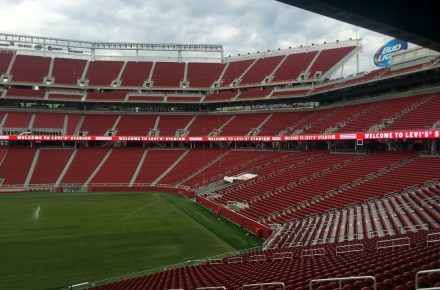 The Earthquakes have agreed to play one match a year at Levi’s Stadium for its first five years. Their regular home is Avaya Stadium in San Jose. 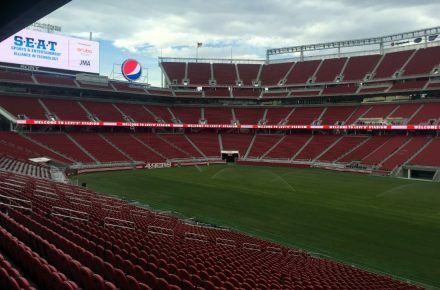 Levi’s Stadium also gets regularly used for national team matches and hosted the final of the 2017 CONCACAF Gold Cup. 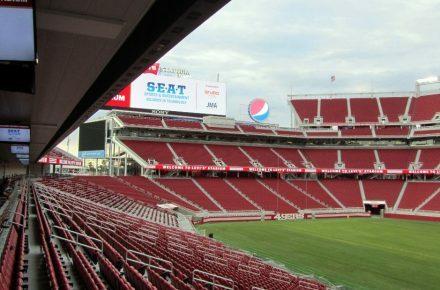 Levi’s Stadium is located in the city of Santa Clara in the heart of Silicon Valley, just north of San Jose and about 40 miles south of San Francisco. Levi’s Stadium lies close to several major freeways, including US Route 101 to the south (connecting with San Francisco and San Jose), California State Route 237 to its north, and the Interstate 880 to its east (connecting with Oakland). If using public transport, the stadium can be reached with the VTA Light Rail, which is a local light rail system that connects the stadium with places likes Mountain View, Sunnyvale, San Jose Airport, San Jose, and Milpitas. Great America station is the station closest to Levi’s Stadium. If coming from San Francisco, take a Caltrain to Mountain View station and change to a VTA light rail train to Great America station. The Caltrain typically runs roughly every 1.5 hours on the weekend, but extra services run on matchdays. The journey from San Francisco typically takes just over 80 minutes but there are a few faster services that make the journey in 50 minutes. The light rail journey to Great America takes another half an hour. From the East Bay area, including Oakland, Berkeley, and further afield Sacramento, take a Capital Corridor train to Santa Clara – Great America station, a short walk away from the stadium. Trains run about every 1.5 – 2.5 hours on the weekends. From destinations further east, including Stockton, ACE trains can be useful, which also stop at station Santa Clara – Great America. All of the above trains also run from San Jose. 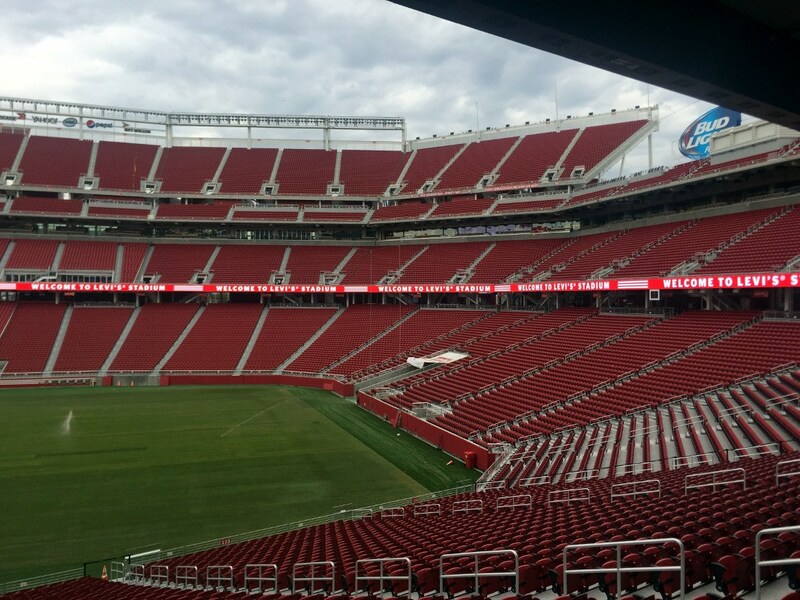 Levi’s Stadium houses the 49ers museum, which is open Friday to Sunday from 10 am to 5 pm. Tickets cost $15.00 and can be bough in advance online. 49ers.com – Official website of the San Francisco 49ers. 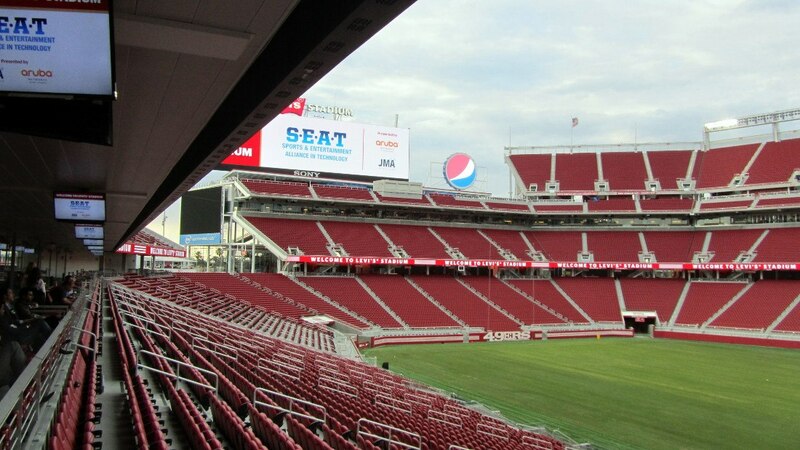 Levissstadium.com – Official website of Levi’s Stadium. Santaclara.org – Santa Clara visitor information.